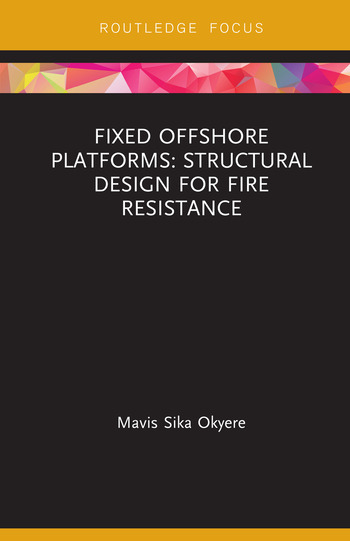 This book examines the fire-resistant design of fixed offshore platforms. It describes the required loading, load combinations, strength and stability checks for structural elements. It also explains the design of tubular joints, fatigue analysis, dynamic analysis, and impact analysis, Fire resistance, fire, explosion and blast effect analysis, fire protection materials, and safety. Introduction. Design Methodology. Design Requirements. Structural Analysis. Impact Analysis. Lifting Analysis. Transportation Analysis. Fatique Analysis. Dynamic Analysis. Foundation Design. Fire Resistance. Fire, Explosion and Blast Effect Analysis. Fire Protection Materials. Fire Safety. Mavis Sika Okyere (neé Nyarko) is a pipeline integrity engineer at Ghana National Gas Company. She is an expert in risk-based assessment, pipeline integrity, corrosion monitoring, and cathodic protection design. She has experience with piping & pipeline engineering principles as applied to both onshore & offshore conditions. Mavis studied MSc. Gas Engineering and Management at University of Salford, United Kingdom and BSc. Civil Engineering at Kwame Nkrumah University of Science and Technology, Ghana. She worked with LUDA Development Ltd, Bluecrest College, INTECSEA/Worleyparsons Atlantic Ltd, Technip, Ussuya Ghana Ltd, and Ghana Highway Authority. She has published in several books and journals, and is a member of the Institute of Gas Engineers and Managers (IGEM).